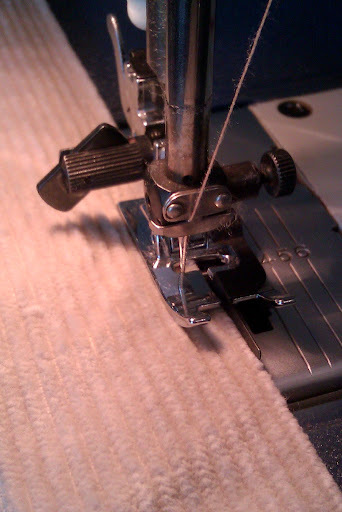 Born on the Bias | Sewing garments slowly. “You makin’ a dress? Mm-mm, them bugs in the park will LURVE YOU, yes they will!”, said the best man in the world in a singing Southern accent down at Paron Fabrics, and continued: “You from London? The Bridge fallen down yet?”. I can’t even begin to describe the sheer heaven New York’s Garment District is. I’ve read a thousand sewing blog posts about it over the years and read them again before my trip, but nothing could prepare me for the miles and miles of gloriously bolt-bursting isles. My mind was blown, stayed blown and will never be the same again. I tried my best to be organised. 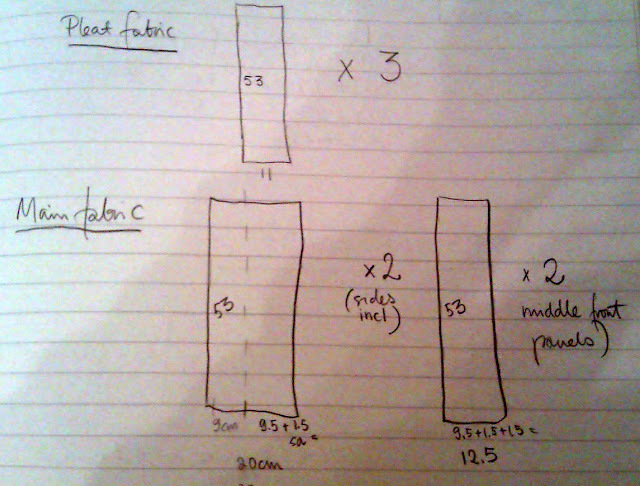 I had a list of fabrics I had never seen in real life in the UK before, and pictures of garments I wanted to knock off. I also wanted to give plenty of room for serendipity, of course. 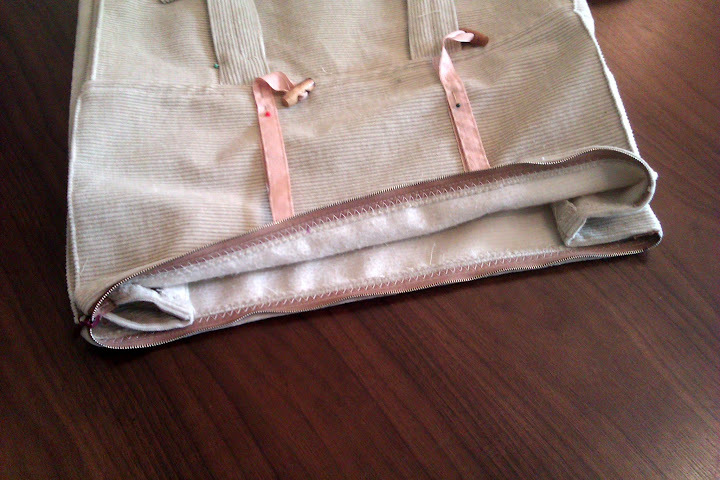 Equipped with my new fabric shopping bag and the blog Shop The Garment District’s invaluable map, I invaded. From then on, it’s all a blur. The Garment District ate me alive. All-over-the-place emotions I felt, often within seconds of each other, or all of them at the same time! I guess “Anger” and “Pride” kick in when I sew up my fabric. 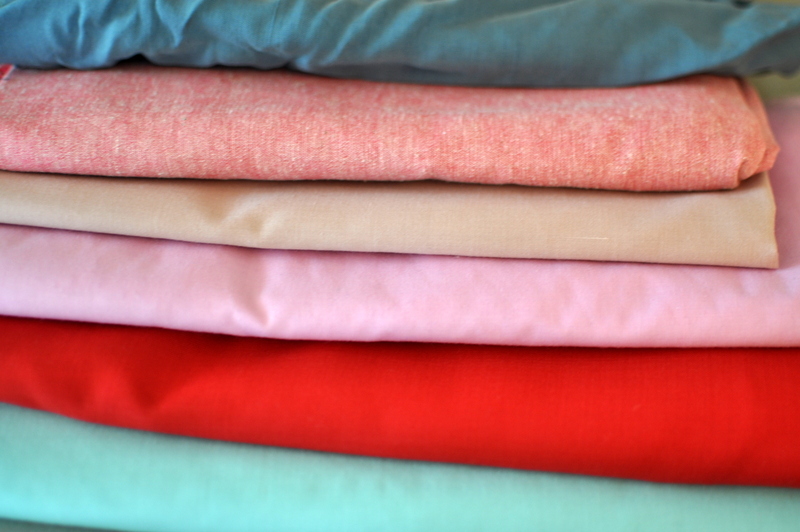 Don’t buy anything you can get in London (like silk organza, general bargain-hunting, haberdashery). Go spectacular! Only take swatches and photos on day one – DO NOT BUY! Think it over and plot your projects, then go back. Otherwise it’s like going to the supermarket starving without a shopping list – you’ll eat wine gums with Babybel cheese for dinner for a week. Don’t hesitate when you fall in love (but only after the first day’s DO NOT BUY ban. Perhaps). Try not to panic. This is not the only time in life you’ll see fabric. Try to refrain from hiding bolts in secret places in the shops for your next visit, Petra! In Mood, by the zips: Dog bowls, but where’s Swatch?! But Swatch, why are you barking and going doo-lally at this nice shopper? 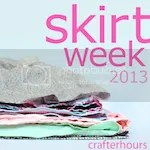 Or are you scared of fabric? Staff to the rescue! And HE knows what’s troubling our Swatch. Toy rolled under the shelf! Swatch is wagging his imaginary tail once again! NY Elegant Fabrics. Treat! : Click here to go inside the shop on Streetview! Fabric shopping bag in action at B&J Fabrics, but nowhere near full yet! Chuffed with its performance! Click here for many more photos! Biggest lesson learned from this: Spend more money on fabric (she says while eating porridge for dinner for a month). Look for better quality and fall in love. It’s time to step up my game. 50 yards bought. 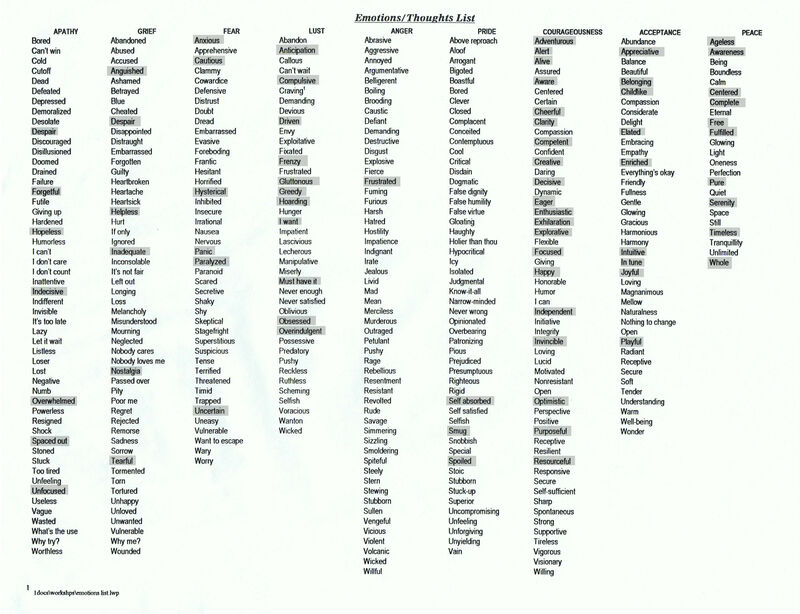 Now some serious planning can begin – Head, be blown again! A working girl’s day never seems to end, not for Megan, not for me. My colleague and inspiration, Megan. We work in the same office and wear the same uniform (several colour ranges to choose from, though – very liberal). Thing is, they deduct the cost from our salary, so I made my own instead. STICK IT TO THE MAN. 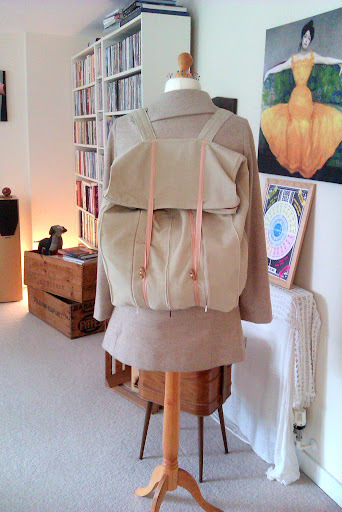 I covered the draping of this make here and the construction here as my tale is too long for one post – why not pop over? From In tray to Out tray – done. Uh-huh… Yeah… NEVER!… You tell him and you tell him GOOD! 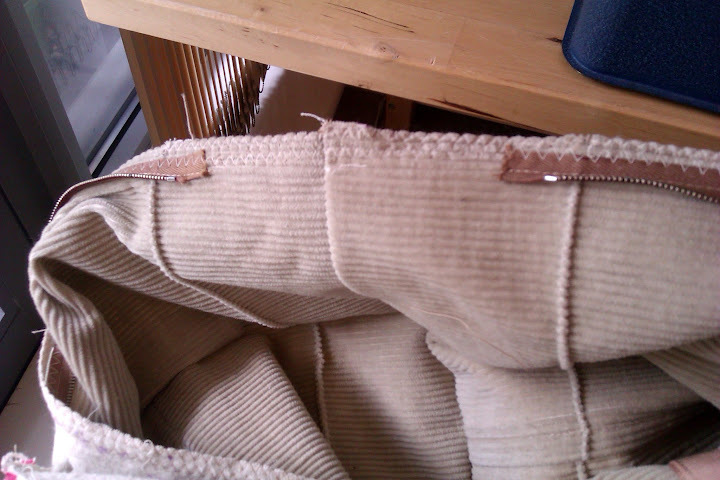 Little pieces of fabric stuck to the pattern pieces to avoid confusion. So proud. 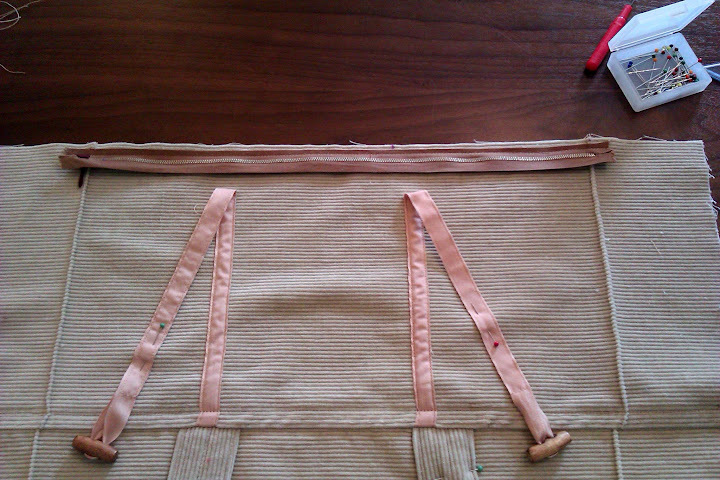 Front midriff constructed. 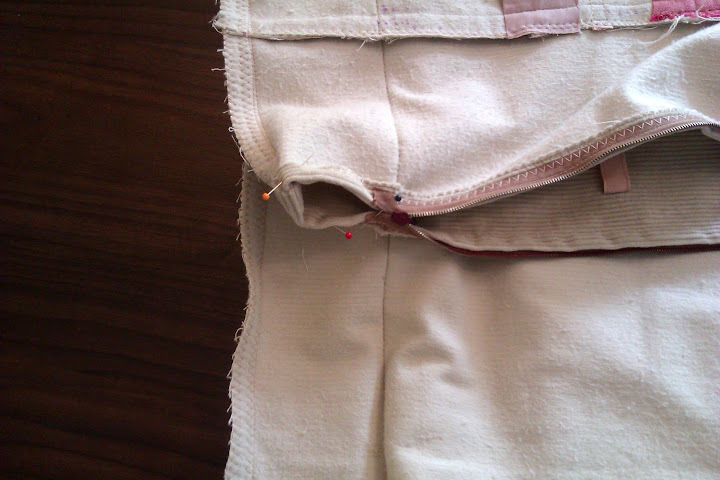 Seams always pressed away from the white fabric as that’s the most see-through fabric. Thank goodness I’m behind a desk, so the boss can’t see I haven’t finished the skirt (=started on it yet)! 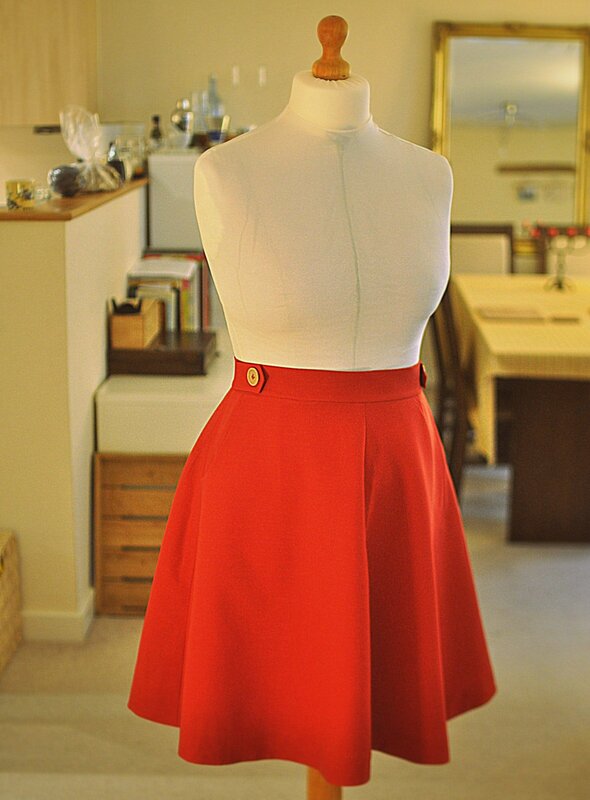 My plan is to sew a Hollyburn skirt (my red one here) in the same mustard fabric and wear as faux dress, or separately, as it might get a LITTLE too mustardy… especially as it doesn’t even come with a lovely hot dog. Here’s a GREAT trick: I cut the sleeves on the bias for extra movement so I can reach lever arch files on the top shelf and just for general movement. Turned out SUPER! But dang – I forgot to remove some ease and lose some pouffy-ness. Next time. After all that work AND I got also all the filing done, it’s drink o’clock, don’t you agree? Thank you SO SO much, Julia Bobbin, for hosting this cracking challenge. When Harry is old enough to go to school, why don’t you come and work with Megan and me? 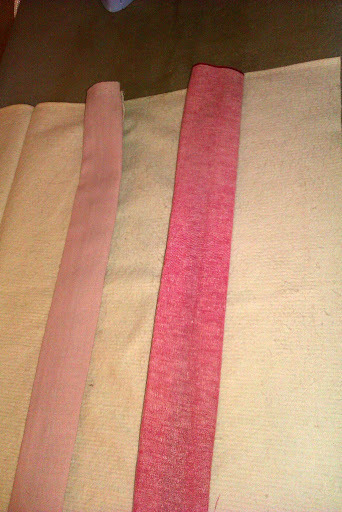 After making the toile, ironing out any mis-matches, I went onto cutting the fabric. Fabric… I so wanted nice fabric, as I’ve been trying to up my game recently. I had either stretch woven fabric or double-knit in mind, but couldn’t for the life of me find any, especially in lots of plain colours. So I went to Simply Fabrics in Brixton and later to my local West-African shop on Rye Lane, Peckham, which are both brimful with a rainbow of poly-blends (£1.50/metre). It’s cheap by price tag, cheap by touch, but what can a hue-hungry girl do? In Brixton I found a mustard tone, and decided that would be my main colour no matter what. Then paralysis set in. I must have stared motion-less for half an hour at all the rolls. WHY is it so hard to just pick three colours? 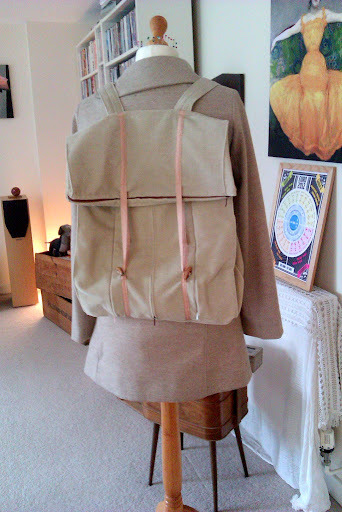 I did settle for a stone grey and a greyish pink in the end, only because by then the shop keeper had asked 187 times if I needed any help and I was worried he’d call the Social Services (it only just dawned on me that I could have replied yes to his question). 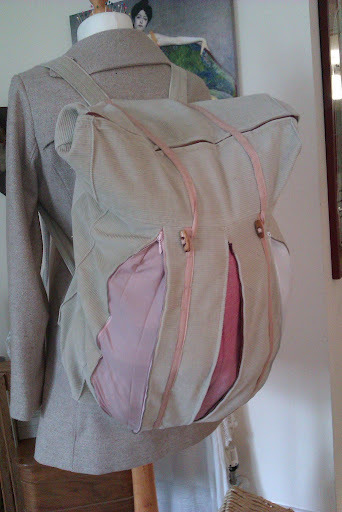 At home, the motion-less stare continued, not helped by the trip to the Rye Lane shop with another bag full of more colours, as the grey and pink (for the neckline) made my face look like a dirty blotch-fest. Must have gone through a hundred colour combinations – some of the ones that didn’t cut the mustard. Nothing like a deadline though to get you moving. In the end I went for an off-white, the stone grey AND A DARK GREY I HAD IN MY STASH ALL ALONG. Now we can start. 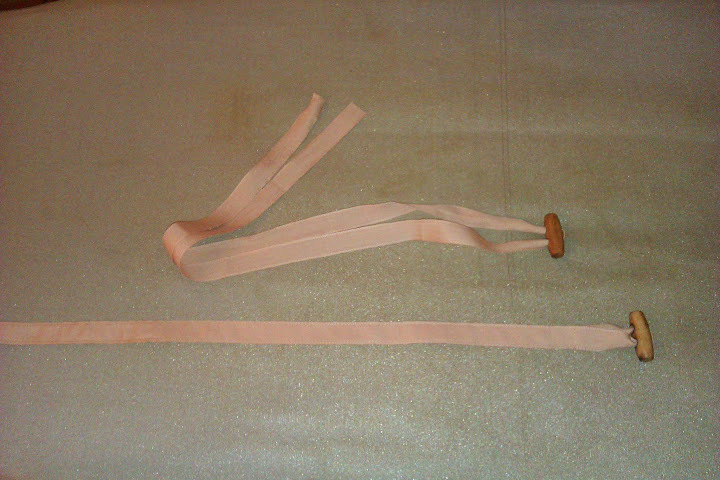 Midriff sections, inside and outside. 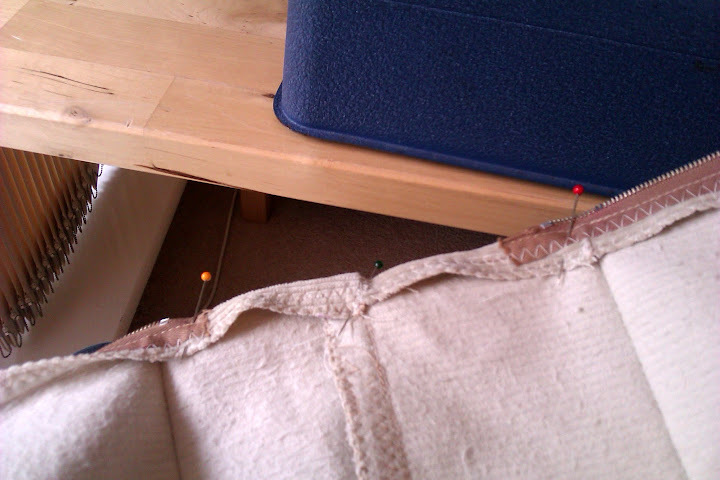 Check out the staystitching – from edge to centre, flip, then from edge to centre again. 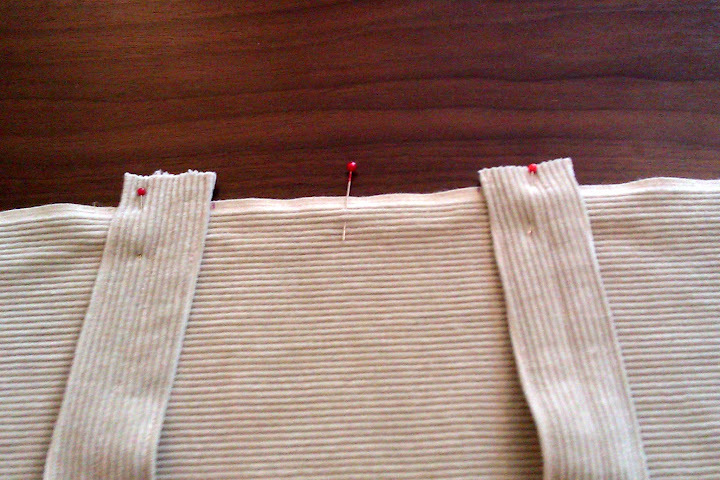 Not QUITE lined up but the seam ripper can take a nap. 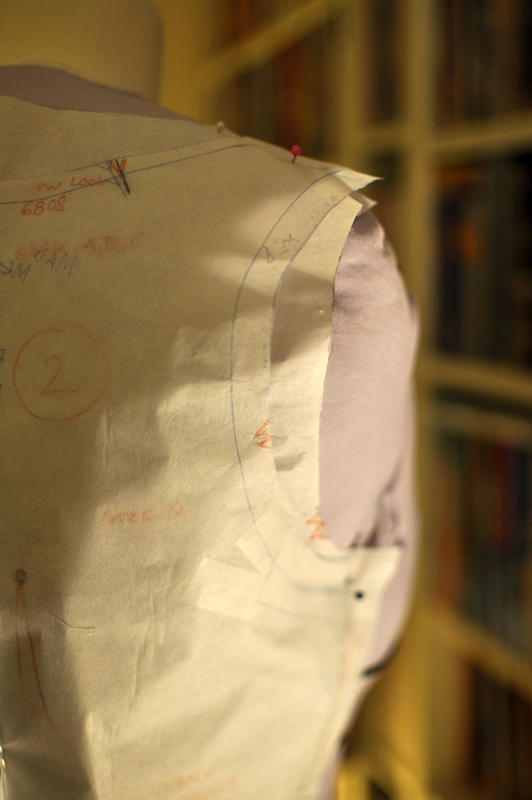 Getting somewhere BUT WHAT’S THAT FLAPPY CRAPPY NECKLINE?! Let’s face it, the polyblend is just not nice to work with. At all. At aallll. It can’t take the iron heat well at all, and no steam allowed or it all goes ripply-gooey. I LOVE the pressing required when sewing, so that’s a real downer. It’s so hard to get anything crisp, boo. Little ripples is seen here and there near the seams, which steam would normally have taken care of. 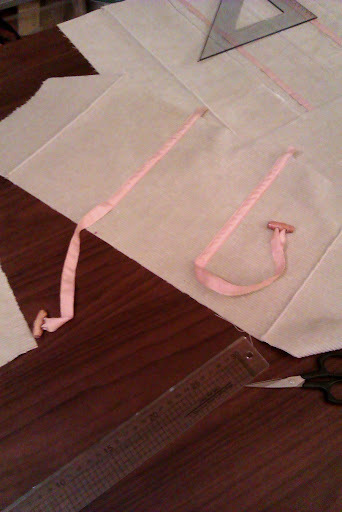 Super-proud of my pinning bits of fabric to each pattern piece to avoid stupid mistakes when cutting the fabric. Fifteen pattern pieces in all, see. 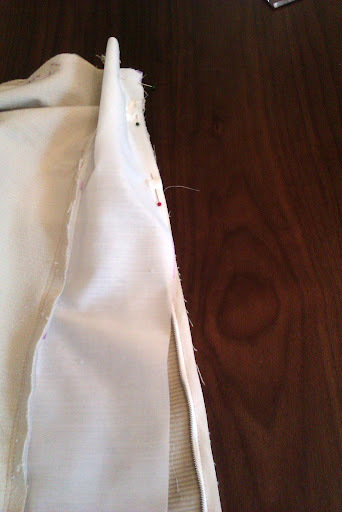 I stay-stitched (from edge to centre, turn, repeat) top and bottom of every single fabric piece (21 of them – woah). 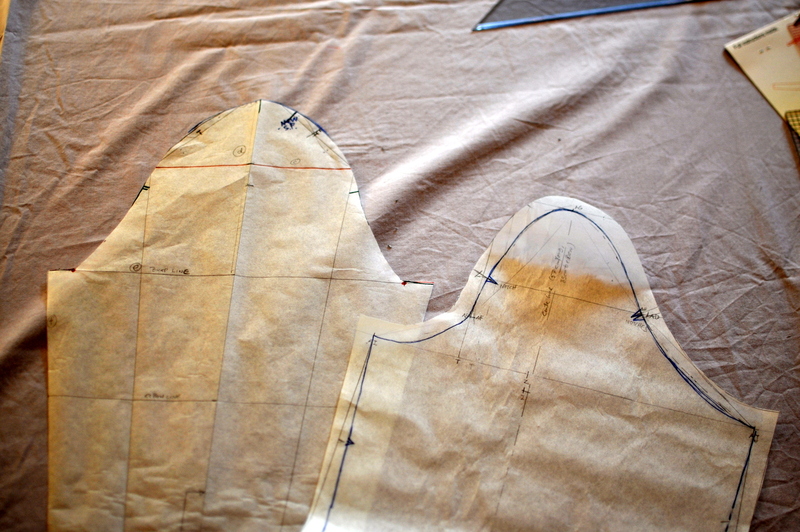 The toile I made was so out of whack in the end it was like liquid, especially the neckline pieces, so I better had. It so helped! 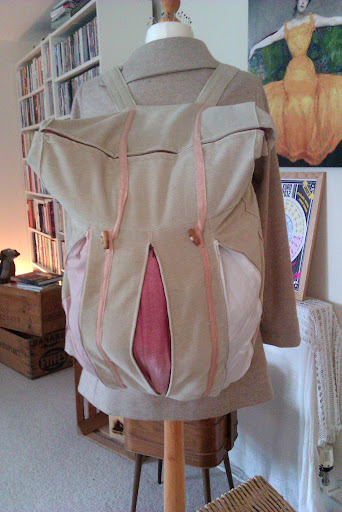 As it turns out, the neckline was still flapping about like a good’un, even with the stay-stitch. So annoyed, as I could have avoided that by increasing the curve (I think). Putting the facing piece made it a LITTLE bit better, but my chest seems hollow above the bust and more care is needed for the future in this area. In all the excitement, I never really stopped and thought of seam finishing. I just constructed along having a whale of a time, and just pinked away for speed. 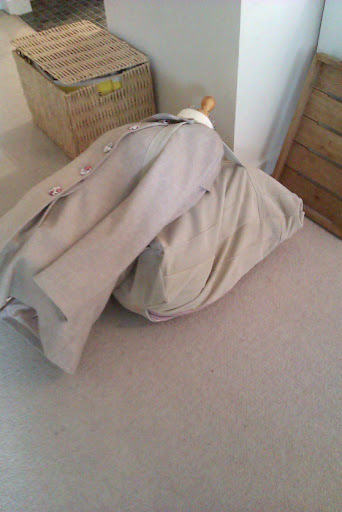 I don’t have an overlocker, but could have used a zig-zag, then trimmed the surplus seam allowance. I do think that could have stretched the edge though, which would not keep it crisp. So I just pinked the bejesus out of everything – it just feels sooo nice. 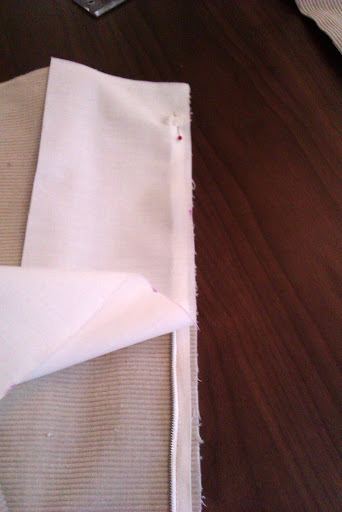 I pressed all seams away from the white fabric to avoid them shine through. Another thing I skipped all together was lining. I normally line with a nice-to-the-skin cotton, but I felt too lazy (I just re-typed that five times before deciding to tell you the real reason why I didn’t). It all came together like a dream. I had a few places where the panels didn’t quite line up easily and perfectly, but we’re talking a millimetre or two. 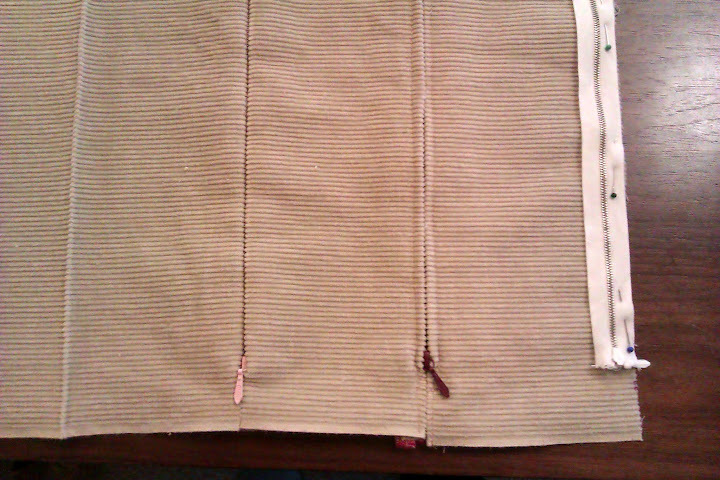 Even the invisible zip went in OK, lining up the different panels reasonably well. 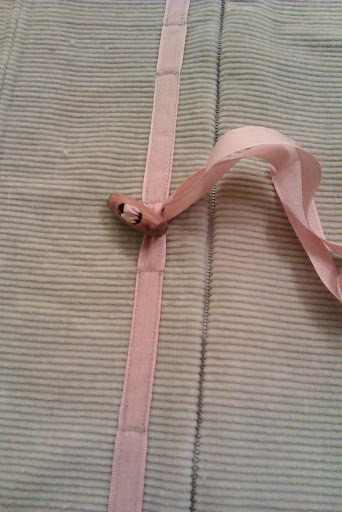 I ad-hoced a zip seam binding. 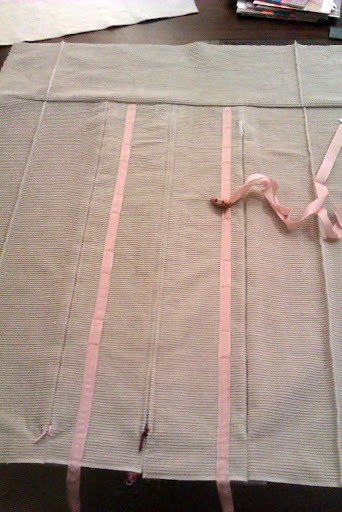 Simple enough with bias tape, but it was a little tricky to keep it all straight. I am happy with the end result, as the binding gives the seam nice strength and support, I just need to stitch it on better, s’all. 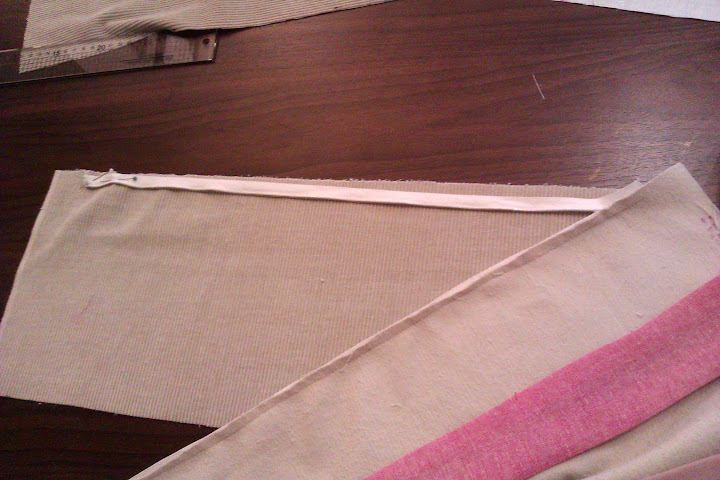 I was hoping to line up the sleeve strips with the waist strips, and yep they do. 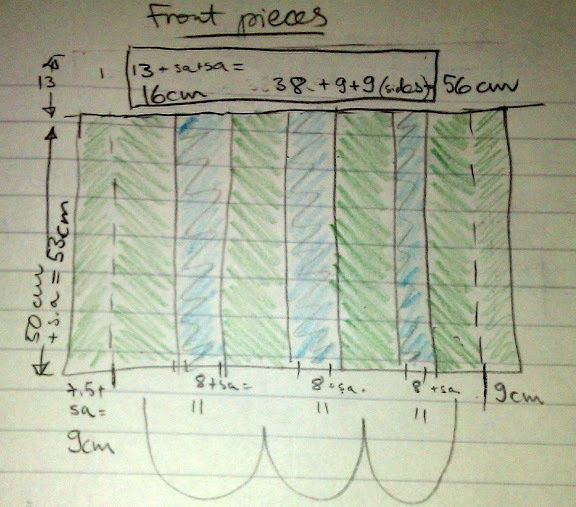 I had added 3cm hem allowance, but 2.7 of them must have gone fishing because it felt very short. So a simple narrow hem had to do the job. Love making them! Woah, how long is this post?! Coming up: The Finale. I’ve wanted a perfect t-shirt pattern for eons, to have as a quick sew fix and to keep my chest drawer full of grand colours to compliment my outfits. So when Sewaholic released the Renfrew, I got it straight-away. Erm, it was released a few weeks ago, wasn’t it? According to the envelope, I should be Bust 16, Waist 14, Hip 10. That’s one crazy, eighties’ bodybuilder triangle, so I cut Hip 14. I’m glad I did, the hip is the only thing that seems to be issue-less. I used 4-way super-stretchy, thin knit from my stash, which is VERY silky smooth and comfy. This is against the pattern’s recommendations of stable knit, but hey, you use what you have. 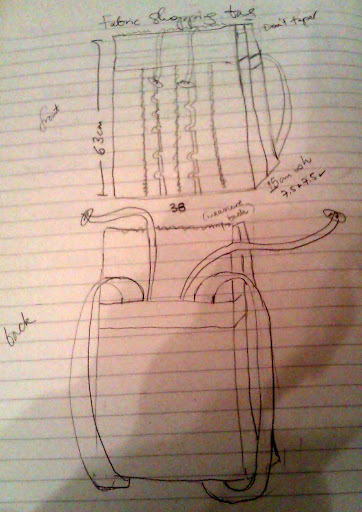 So this slinky-dinkyness will influence some of my fitting issues greatly, but here are my notes nevertheless. It’s way too big under the arms (although the armcye/sleeve is roomy and comfy, it’s more casual than I need my tops to be). 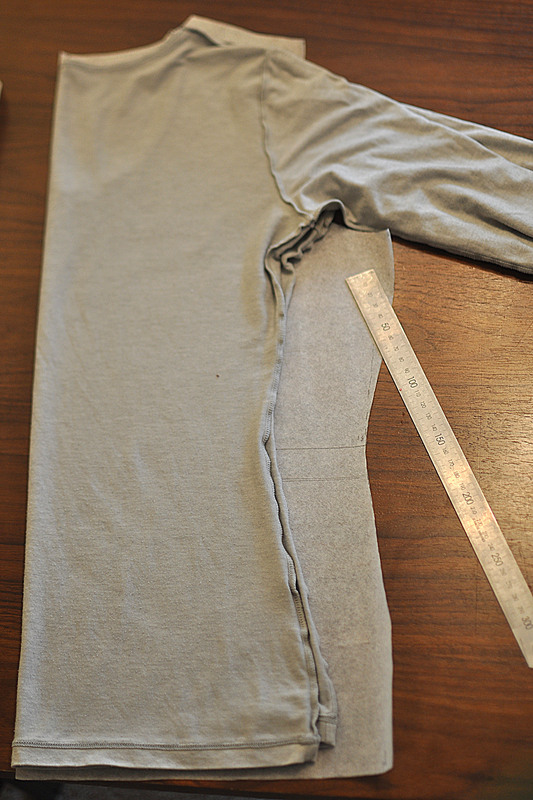 The shoulder is about 2cm too wide, making the sleeves hang over the shoulder edge. Sleeves are sooooo long. 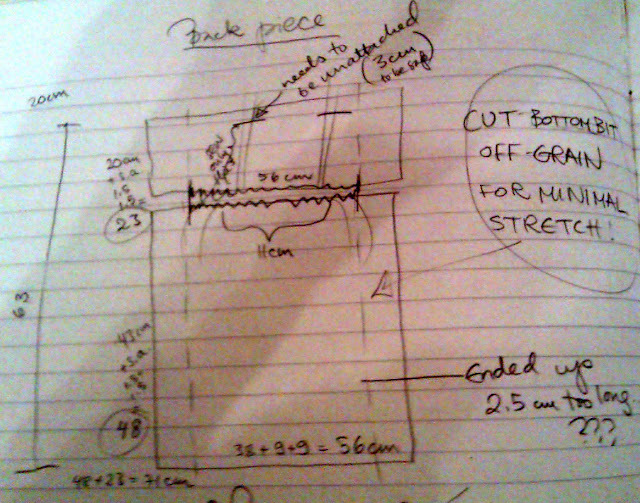 OK, I just cut it straight from pattern without measuring at all, so silly me. I have to shorten them by nearly 6 inches! I feel abnormal. But good thing is I’m not a monkey. 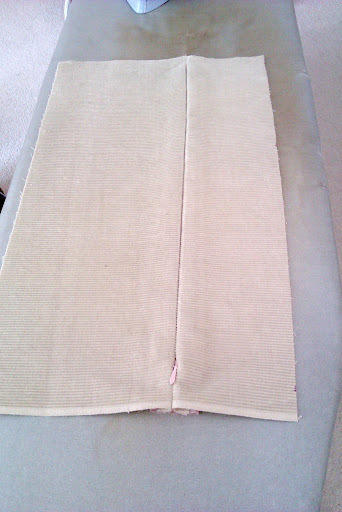 Waist is OK, I don’t want to tweak that yet as stabler knit might change to fit and feel here. 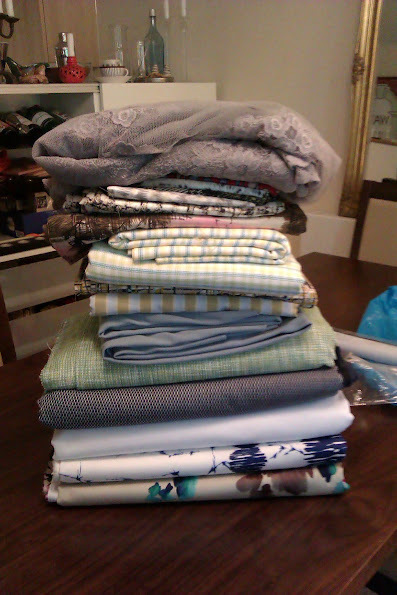 The huge problem is the pooling of fabric in the small of my back. I always have to make swayback adjustments on all garment, but there’s never been this much pooling. 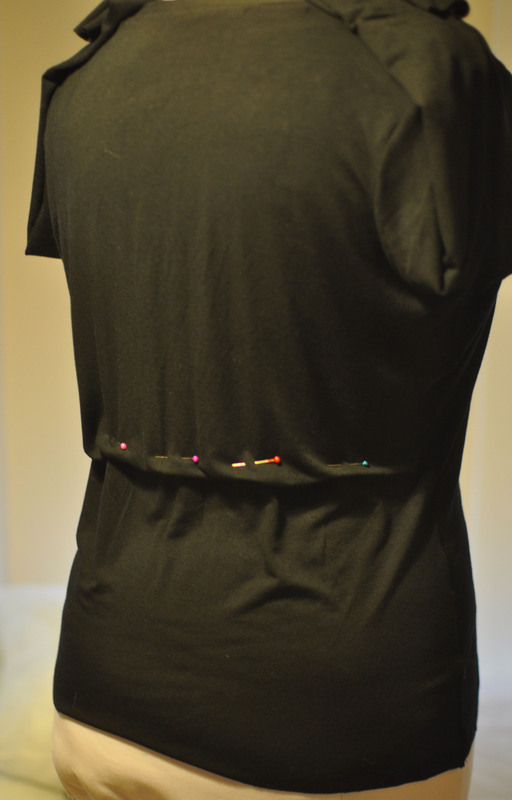 I did start to pin the excess, but it just seems to be way to much fabric hanging from my upper back, width-wise, below my shoulder blades. 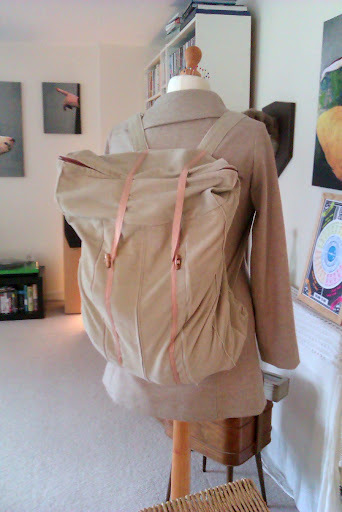 But the upper back is fine, so I can’t simply say that it’s a size or two too big (or can I?). 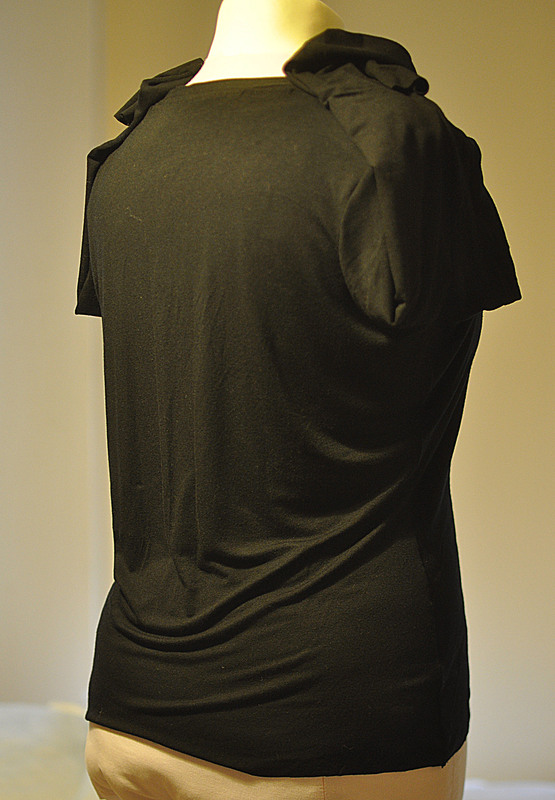 I folded one of my favourite t-shirts (very fitted, and the fabric is similar) and LOOK at the difference! 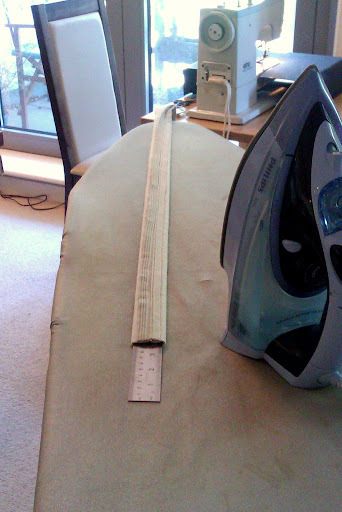 Woah – about 6 sizes smaller?! 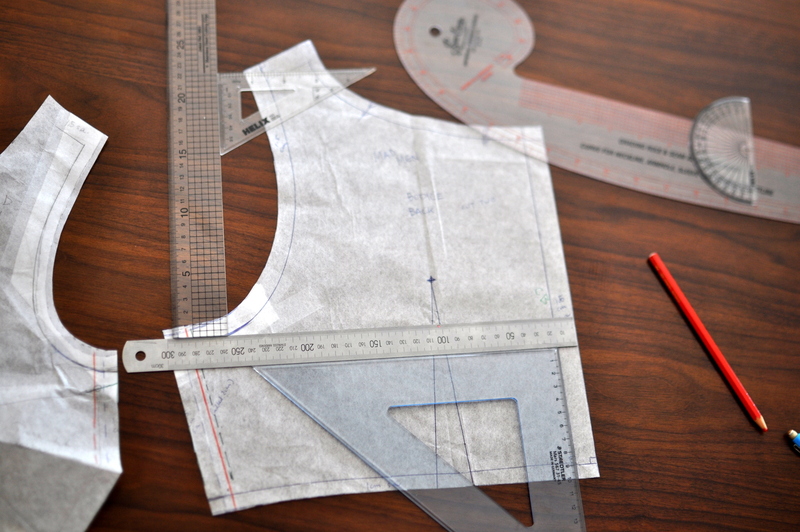 Work on the pattern’s fit, solving all the problems and be proud? Who knew a t-shirt pattern can make you break into a existentialist crisis. 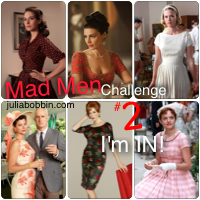 This was supposed to be a quick fix as I’m recovering from a tonsillectomy, and before I take on Julia Bobbin’s Mad Men Challenge 2. I’ll just have to forget today ever happened, and start afresh another time.